By now, you probably know Mosko Moto is a very unique company. With no dealers or retailers, they sell all of their products direct. This cuts out the middle-man, and saves money in order to have a higher quality product. Much of the design in every piece of Mosko gear is designed with the help of it's customers. The team spends hours upon hours collecting ideas, insights, and preferences from thousands of riders online. This is all in an effort to make sure that the product is exactly how YOU, the rider, wants it to be. Years were spent planning this one-of-a-kind tank bag, and it's finally available. Our experience with the Nomad has been nothing but incredible. From it's adaptability across almost every bike, to it's durability and functionality. Instead of designing a tank bag based off of others already on the market, it was built from the ground, up, to create something very unique. First and foremost, those of us that live in the Pacific Northwest have to deal with a lot of rain, but don't want to get our luggage wet. The crew at Mosko knew this would be a vital detail, so they included a nifty rain cover that packs down into it's own tiny pocket. A highly noticeable feature of this bag, is it's ability to turn into a backpack. Perfect for those times you are leaving the bike and want to bring along your luggage easily, or when you need a bit more room up front when you get to the trail. Just pull the straps out of their storage compartment, clip them to the "Mosko Blue" hook points, and throw it on. The bag detaches, and re-attaches, to the bike in seconds. Ultimate portability. Seen here with the Mosko Moto Fatty Tool Roll. Gold Bar, WA. I have spent years wearing backpacks that have the water reservoir built into them. It's very convenient, you can grab the hose while riding and getting some hydration going any time. The downside? Having 100oz of water riding on your shoulders. Mosko recognized this dilemma, and fixed it. They snuck a Platypus hydration bladder into the lowest point of the bag, with a hose long enough to be used while riding, standing next to the bike, or while using it as a backpack. Once you open the multiple layers of compartments, you see right away how easily you can organize all of your things. 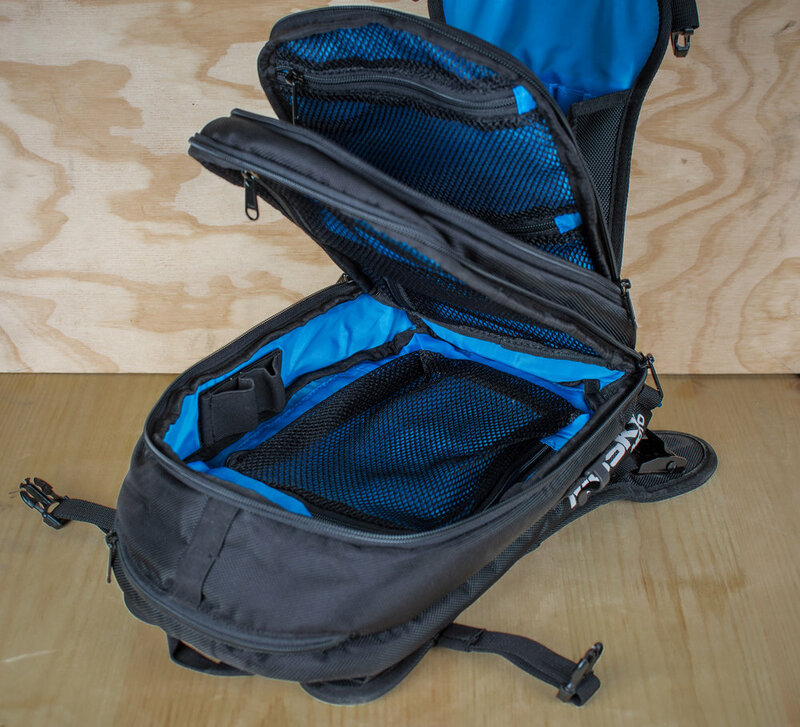 Most tank bags are just one large compartment, so everything gets piled in one pocket. However, with the Nomad, each compartment has many different spots for items, so every item inside has a storage location. You'd be absolutely surprised how much stuff can fit in it! 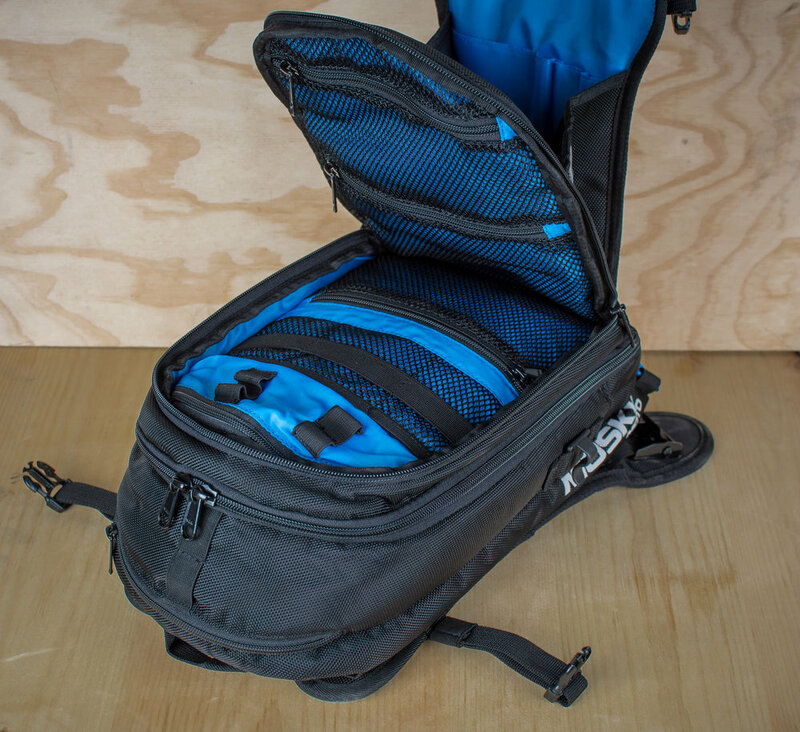 The cinch straps on the side allow you to shrink the bag down if you are packing light. If your adventures require you to have the Swiss Army Knife of tank bags, you need this one.